For many expats, a “visa run” is a common part of life. This is when you have to leave the country in order to come back on a fresh visa. 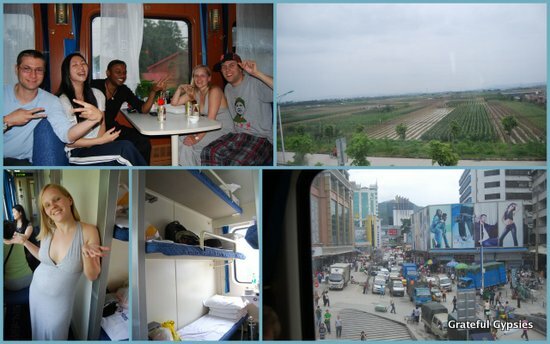 When we were living in Beijing, we were low on both cash and time and really only had one option – the 24-hour train ride to Hong Kong. A hard sleeper ticket is only 500 RMB, and it gets you a spot in a small cabin that has six beds. We passed the time on the train staring out the window, watching movies, and meeting other travelers over beers in the dining car. It wasn’t a terrible ride, but it’s definitely one we’re happy we haven’t had to repeat. 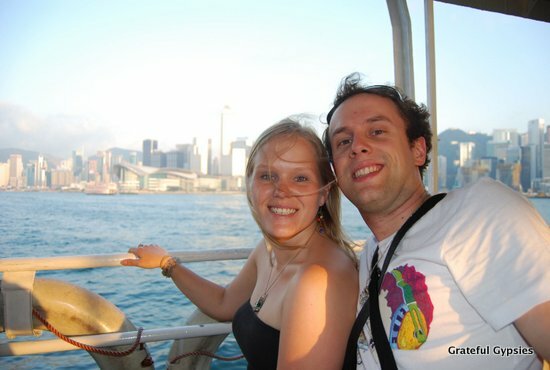 With only two days to spend in Hong Kong and a very limited budget, we tried to do as much as we could on a shoestring. This involved staying at the legendary (not for a good reason) Chunking Mansions on the Kowloon side of Hong Kong, a lot of walking, and eating and drinking primarily in the streets. Cheap hostel, street food, and lots of walking. Despite our lack of time and funds, we ended up having a great couple of days there, thanks in large part to the fact that a friend from Beijing is actually from Hong Kong and just so happened to be there visiting his family. 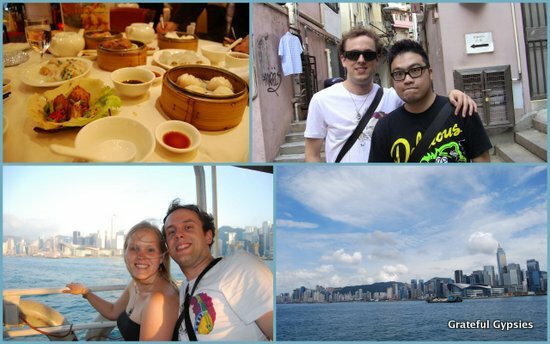 He took us out for a traditional dim sum brunch where we sampled a wide variety of Hong Kong’s most famous dish, led us on a walk through some popular spots, and even took Rachel shopping. Having a local friend is great! Even when we were left to fend for ourselves, we managed to get around just fine. Hong Kong is a highly developed city with great public transport, and most people there speak English and are very approachable and helpful. Any time we looked remotely lost or confused, a local was quick to offer directions or advice. 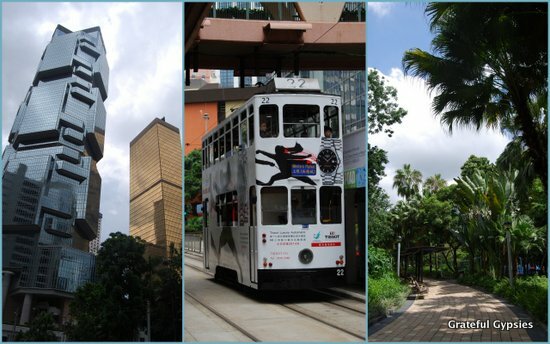 Skyscrapers, the tram, and Victoria Park. 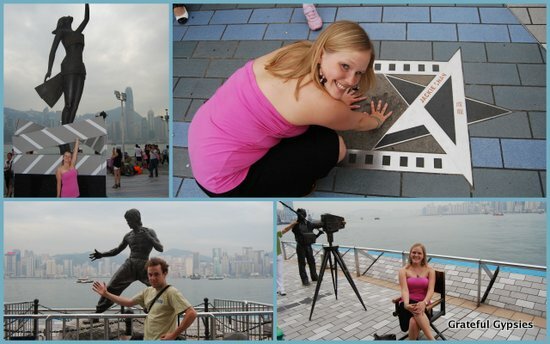 As far as sightseeing goes, we took in the view down at the Victoria Harbor and strolled along Hong Kong’s Avenue of Stars. At night, we sprung for the all you can drink cruise to take in the nightly music and light show, and we made sure to get our money’s worth. From there, we took the bus up to The Peak, where we enjoyed a panoramic bird’s eye view of the city. Jackie Chan and Bruce Lee on the Avenue of Stars. Later on, we met up with another friend who came down from Guangzhou, and we all wandered through Kowloon’s street markets, sampling different snacks and buying beers in 7-11. We randomly found ourselves smoking hash in Kowloon Park with a group of Afghanis. That’s one thing you’ve got to love about traveling – people from two countries at war with each other, sitting down in a park and passing a joint around. Unfortunately, our restricted budget ensured that we didn’t get the chance to take in any of Hong Kong’s popular bars or nightclubs. Making new friends in the park. 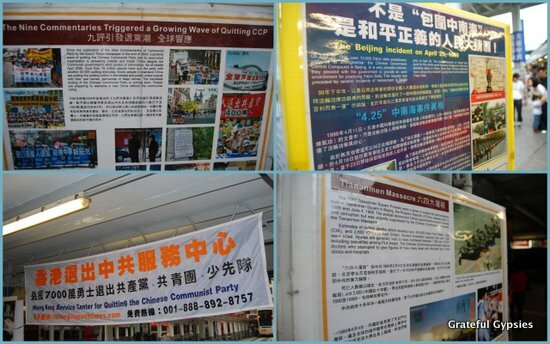 We were surprised to see a variety of activist groups set up in Hong Kong, protesting the Communist Party of China and openly displaying information about the Tiananmen Square incident from 1989 as well as other sensitive topics like Tibet and Taiwan. While Hong Kong was in fact returned to China in 1997, it’s important to realize that it functions more or less as its own country, with its own currency, local government, and so on. We finally made it back to Hong Kong in the summer of 2014, as we found cheap flights from there back to Detroit. On our second visit, we actually stayed in Central thanks to an awesome Couchsurfing host. 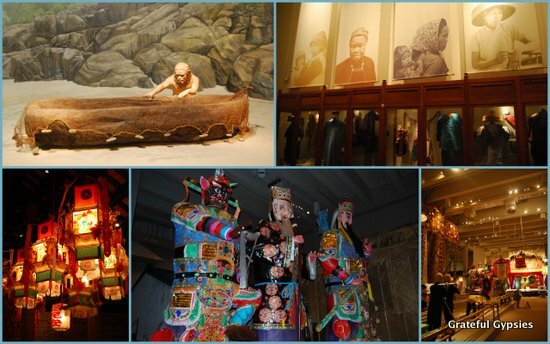 We enjoyed a fabulous brunch, spent an afternoon wandering around HK island, checked out the Museum of History, and partied it up in Lon Kwai Fong, HK’s premier dining and nightlife area. Learning about Hong Kong’s history in the museum. 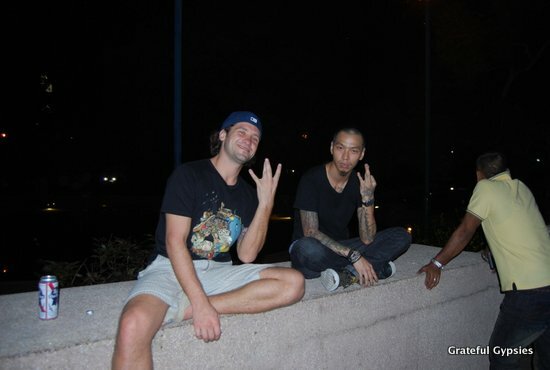 Raging with friends in HK. A Day on HK Island. With one last full day, we decided to take a day trip to Lantau Island. 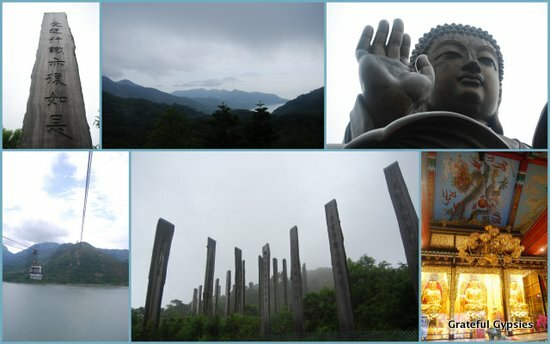 A scenic cable car ride brought us to the other side of the island, where we walked up to see the Tiantan Buddha. There’s also a monastery and an interesting little nature walk called the Wisdom Path. Although we didn’t have the best weather, we still had a good time. Had we gone a bit earlier, we could have checked out a fishing village or maybe a beach, but we are notorious slackers and tend to sleep in and take our sweet time getting ready. Lantau is also home to HK’s Disney Land, a big draw for families. Lantau Island – a great day trip. Check out Lantau Island with this video. Taking the ferry over to Kowloon. Transportation: As a major transportation hub, you can get into HK just about any way possible. We’ve taken the 24-hour train ride from Beijing (500 RMB each for hard sleeper tickets), flown in and out, and also crossed the border via Shenzhen. 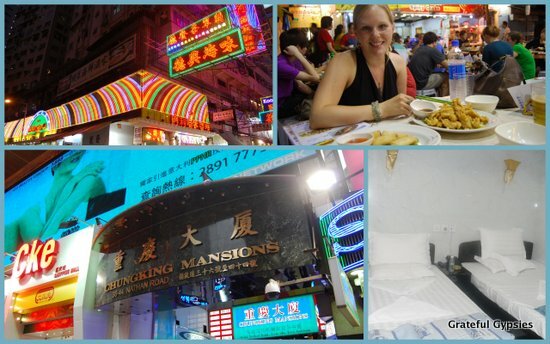 Accommodation: A double room at the Chunking Mansions in Kowloon costs around $20-30 depending on which hostel you book. It’s nothing special, but it’s good enough for a few nights. On our second trip there, we were lucky enough to find a host via Couchsurfing. Get Around: There’s a good subway system in HK, plenty of buses, cabs, and even a double-decker tram. For going between HK and Kowloon or the islands, there are a variety of ferries. 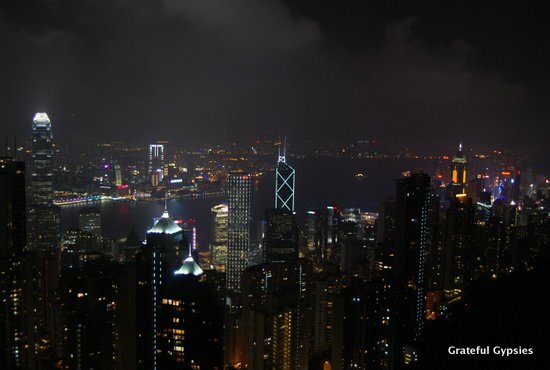 Activities: HK is full of great things to do – do a Victoria Harbor light show cruise, visit The Peak, stroll the Walk of Stars, explore Kowloon Park, take in a museum or two, go to the islands, hit some night markets, and enjoy the great nightlife. Food and Drink: Make sure you have a dim sum brunch at some point in your trip. There’s just about every kind of cuisine imaginable in HK, so you definitely won’t go hungry there. 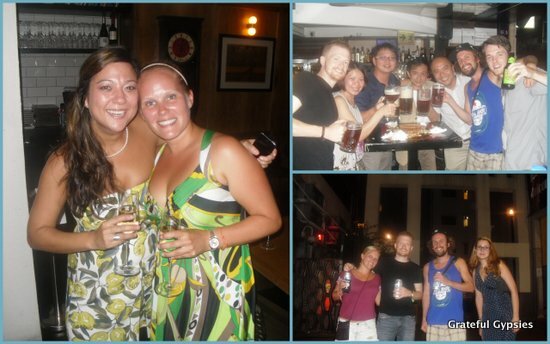 There are also tons of bars and clubs, so night owls will have no trouble finding a good time. Recommended Time: You could easily spend a week or more in Hong Kong, especially if you want to include an island or two and maybe some hiking. We’ve never stayed more than three nights, but that’s a pretty good amount of time if it’s all you have.